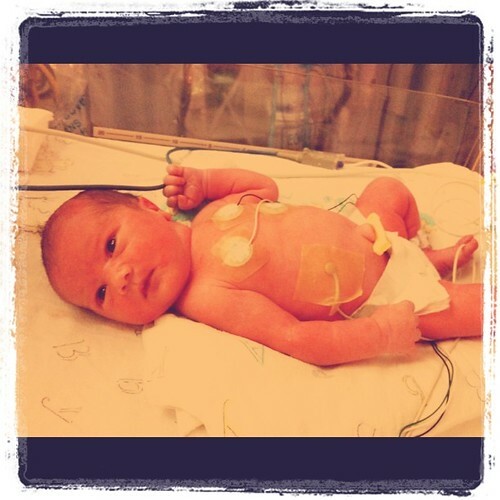 I am sure you have heard by now….SLOANE JEFFREY ROSE has arrived! He was born on Monday, May 16th at 2:04 pm! My friend Kelly was so excited that his birthday was going to be “mathematically correct”. She’s funny! You would think she was a math teacher. Nope. Kindergarten. But, then my friend Nina reminded me that Bents birthday was also mathematically correct. P Man’s is not. So it doesn’t get too weird. Ha! If you follow me on facebook or twitter then you didn’t miss much. Haha! I’m kinda open like that. Plus, it was my distraction from the pain. And there was lots of pain. In turn, lots of tweets. 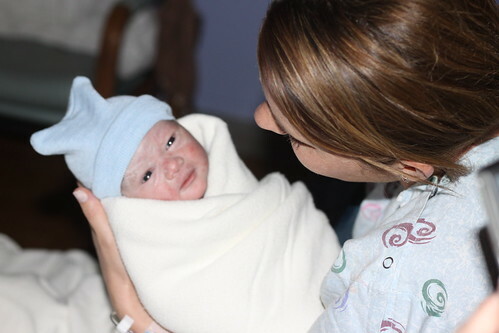 He came in to the world at a whopping 6 lbs 15 ounces and 19.5 inches long! I was shocked he was so small! I was expecting an 8 pounder! My guess was 8’2. I guess I was way off! He’s such a peanut! But, then again, he was only 37 weeks 4 days! How weird that I predicted I would go in to labor on Sunday and deliver on Monday??? If you don’t believe me, read what I wrote last week HERE. Sloane had to spend some time in the NICU immediately after he was born. They were worried his lungs were underdeveloped because he started what they call “grunting”. Apparently that can be a sign that his breathing is distressed. I did get to hold him briefly and then they took him away. 🙁 They did a chest x-ray to make sure he didn’t have a hole in his lungs, which he did not (Praise God) and then they hooked him up to the c-pap machine for a little help breathing. 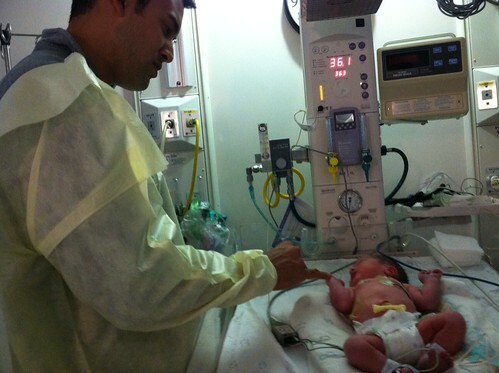 Luckily he wasn’t on that long either and then they just kept him in NICU to monitor his oxygen levels. We were able to visit him in the NICU a few hours after birth. He was so sweet and looked so different than our other two! 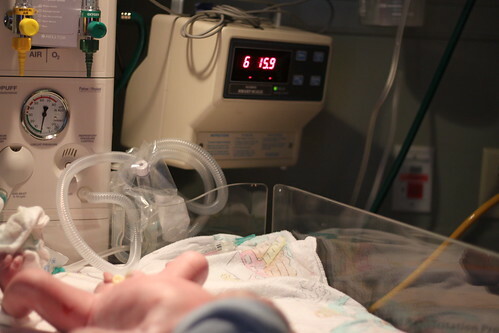 We didn’t stay in the NICU too long because I was really feeling terrible. Actually, they barely got me wheeled out the NICU door and I was puking all the way back to the room. YUK! I will save the birth story for another post. He is just doing wonderful now and we are so THANKFUL to God for another beautiful and healthy baby boy! Both of our other boys have J’s blood type. I am RH negative so it was strange that Sloane got my blood type. But, it kinda makes me smile. We get to leave the hospital later today and we can’t wait to get home to P and Bents! They have been in good hands with Gigi and Papa, but mama is missing her kiddos! Thank you for all the prayers and sweet comments! I hope to update again soon! Here is our first video of the little man! This is when we got to visit him for the first time in the NICU! CONGRATULATIONS!!! I actually visited your blog at 5 a.m. this morning wondering if he’d made his appearance yet! He’s perfect – absolutely perfect….! Loved the video! So very happy for you. God is good! 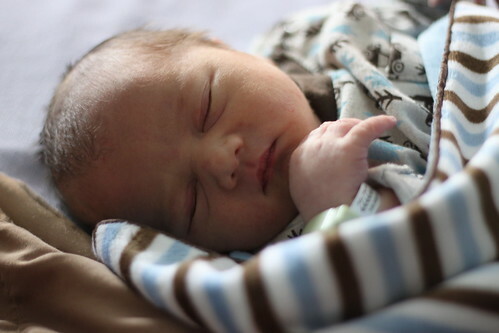 A happy, healthy, adorable baby boy [and two already at home!]. Hope you are feeling a little better and recovering well — bet you are so ready to get him home!!! Congratulations!!! A beautiful baby boy! Congratulations! Such a cute little guy! Happy to hear everything is going well and you get to come soon! Our little guy spent a week in NICU after they heard him “grunting” while I was holding him (it got cut short and sweet). He did have a hole in his lung (that healed) and pneumonia. Scary, but blessed we had great nurses and doctors. What a beautiful little peanut he is!! Enjoy the summer with your three boys! P.S. He looks EXACTLY like you! Hope the recovery goes well. Can’t wait to hear all about your life with 3 boys. Congrats!! He is absolutely adorable. Congratulations! Sloane is a gorgeous (of course) little peanut! Happy to hear everything is okay with the little guy, looking forward to more pictures of him with his brothers! I cannot wait to hear about your birth story! I’m 37 weeks and 4 days today and WOULD LOVE TO HAVE MY BABY TODAY! But, I’m just going to have to wait this one out and see what happens. Sloane is just so handsome and has such beautiful skin! So cute! Congrats and I’m glad that he’s in your arms and doing well! Congrats to you and your family!! He is beautiful!!! Looking forward to hearing your birth story! What a sweet pea. 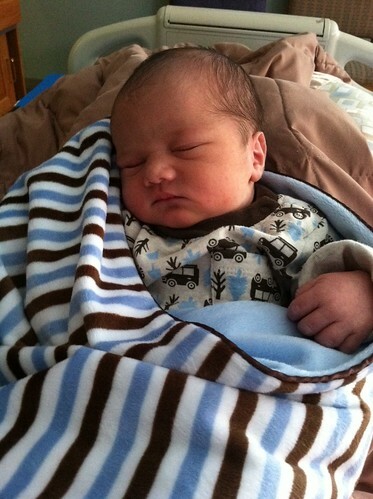 I wish so badly I could just drive over to your house to see him and hold him. I am glad you guys are home and that everyone is healthy and happy. Ill call you soon sweetie!! Love you guys! Welcome Baby Sloane!! You are so handsome!! Can’t wait to hold you again!! If you guys need anything, just let me know!! Congratulations of Baby Sloane! He’s is so precious! So glad to hear you’re both doing well! He is so so sweet. Congratulations! Congratulations! He’s just beautiful! Looking forward to hearing what life is like with 3 little guys!